We Bengalis have peculiar name when it comes to food, chochori, chechki, labra, chachra and not to forget ghonto. How can something be called ghonto ? As a child I always thought it had something to do with bells, bells are known as ghonta in Bengali. Off course that misconception was cleared and Ghonto is a dry mix of vegetables. But wait not all vegetables, you do not have begun er ghonto, but you do have palongshaag er ghonto (spinach) and Lau Ghonto (bottle gourd) and off-course you have bandakopir ghonto (cabbage). 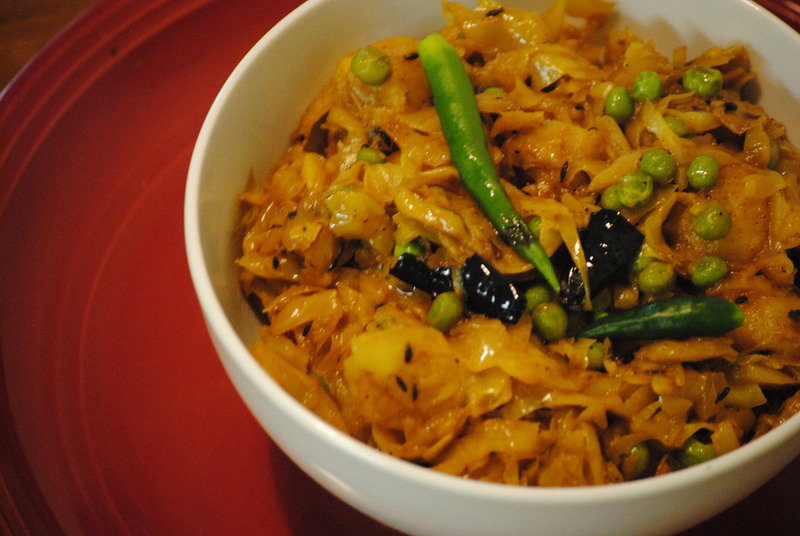 Many Bengali vegetarian dishes derive their name from the way they are chopped, normally vegetable julienne would turn into chcheki, chorchori would be cubed veges, chachra is basically from left over or discarded vegetables and very boney fish or fish head. As for Ghonto, it is probably derived from Ghanta ; the bengali word from mixing. Normally ghonto is a niramish affair, but then there are times when Bengalis would add fish to vegetarian dishes and that is when you have Muri Ghonto; a mix of fish, fish head and rice. This typical Bandakopir ghoto is full- fledged niramish (vegetarian dish) without onions or garlic and a very popular dish for pujor bhog. Off Course if you are a full on carnivore, throw in a hand-full of shrimps. One of the main things about bandakopir ghoto is the way you chop the cabbage, usually medium stripes and the trick is not to overcook the cabbage otherwise they taste soggy. Start by frying the cubed potatoes with a pinch of turmeric, when they turn golden brown you know they are ready. Head a heavy bottom kadhai/ wok with oil , add the whole spices, the bay leaves and the cumin seeds along with the red-chilies, once they start to splutter add the green peas and saute for a minute or two. Next, Add Cumin Powder, Coriander Powder, Red Chilli Powder and of freshly Ginger paste.. You can mix all the above masala in little water to make a thick paste and add it. Now add the finely chopped cabbage and gradually and mix well with the masala. Add the turmeric powder this will bring the colour. The shredded cabbage should be nicely coated with the spices. Now throw in the cubed potatoes and the salt for the taste. At this point you might need to add water, not more than 1/4 th of a cup. Give it a stir now and then, till the cabbage is soft but crunchy. Some like to cover and let the cabbage cook in the steam, but that is up-to you really. I normally do not cover because it tends to make it soggy. 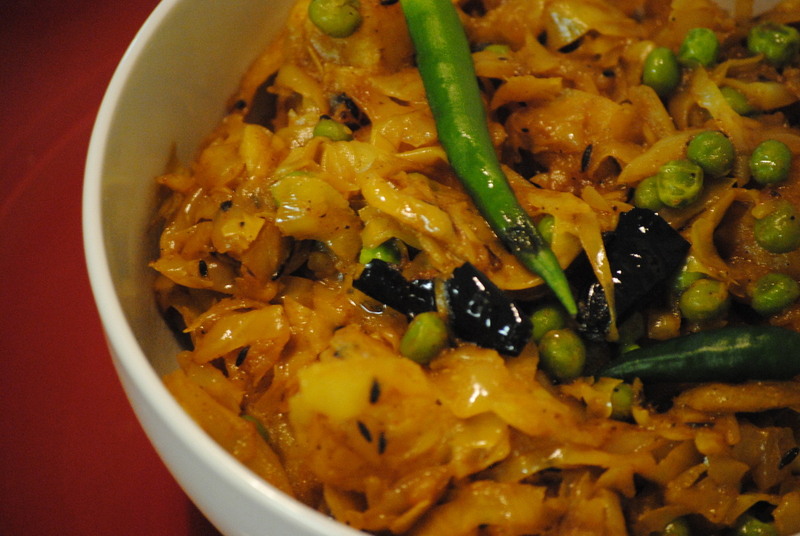 When the cabbage is almost cooked, sprinkle the sugar and the ghee. Mix well and you are done, at end you cold sprinkle some lime juice.